Johannesburg - It’s rare to have two left-handed boxers matched against each other, as the norm is to have pugilists with contrasting stances facing off. 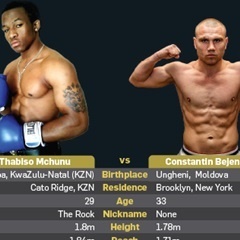 But on Saturday night, southpaws Thabiso “The Rock” Mchunu and Constantin Bejenaru go toe to toe at Mohegan Sun Casino in Uncasville, in the US. At stake will be the vacant World Boxing Council (WBC) international cruiserweight crown. Mchunu fights out of Cato Ridge in KwaZulu-Natal, while his Moldova-born opponent is based in the US. Their clash will be interesting to watch, considering that both are big men with similar fighting styles. They both use a mean right jab before connecting with a big left hook to finish off the opponent. Fans must brace themselves for an epic battle of the lefties. The tale of the tape tips the scales in favour of The Rock. At 29, he has been involved in more action compared with 33-year-old Bejenaru. Having posted 18 wins and three defeats from 21 bouts puts Mchunu in a better position to win the title. He carries a superior knockout ratio, while his losses came via the short distance. Bejenaru has an unblemished record of 12 starts, with three of his victories coming via the short route. But this does not suggest that he will add Mchunu’s name to the list of his knockout victims. The Rock has improved a lot, as demonstrated when he outclassed, outboxed and outmatched Johnny Muller to win the vacant African Boxing Union (ABU) and South African cruiserweight titles at Emperors Palace in June. Meanwhile, Koos Sibiya will attempt to become the country’s first boxer to win the Global Boxing Council (GBC) title on Saturday night. The Mpumalanga fighter collides with Ibrahim Class of Tanzania for the vacant GBC junior lightweight crown at Uhuru Stadium in Dar es Salaam. GBC was formed in 2015 and is based in Germany. The sanctioning body affords talented prospects and experienced boxers the chance to compete for its championship belts. However, it is not as big as other sanctioning bodies like the WBC, World Boxing Association, International Boxing Federation or the World Boxing Organisation. Sibiya currently holds the ABU lightweight crown and is gunning for his second championship belt. The man nicknamed The Great Last Warrior comes into the ring with a record of 21 wins, 10 defeats and four draws from 35 bouts. Emerging victorious will boost his boxing career and increase his bragging rights. The 36-year-old lifted the then vacant ABU title by stopping Baina Mazola of Tanzania in the seventh round at Wembley Indoor Arena in Johannesburg in April. Class, the current 27-year-old GBC lightweight king, hopes to become the association’s first champion in two weight divisions. His last bout was a stoppage victory over compatriot Shomari Milundi at National Stadium in Dar es Salaam in September.